Although the weather is still chilly, it’s time to start thinking about the next year in my dye garden. I like to have as many perennial dye plants as possible, so I have two mature bushes of dyer’s broom (Genista tinctoria) and plenty of madder plants (Rubia tinctorum). I also have lady’s bedstraw (Galium verum), wild madder (Rubia peregrina), dyer’s woodruff (Asperula tinctoria) and two small buckthorn bushes (Rhamnus catharticus). I am nurturing a small evergreen oak, which I grew from an acorn given to me by a friend, and a small Venetian sumac tree (Cotinus coggygria), although it will be a while before these provide serious dyeing materials. The more common Staghorn sumac (Rhus typhina), which grows almost like a weed in our garden, is also a useful tree, especially as a source of tannin. And I mustn’t forget our huge eucalyptus, or the walnut tree, still in its pot, that was given to me three years ago. Unfortunately walnut trees don’t seem to thrive in our garden and I’ve tried several times to plant one, but without success. This is a great pity as walnut is among the most useful of dye sources, so I’m cossetting this one and will continue to re-pot it for as long as I can. 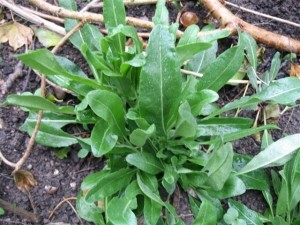 Of course, some dye plants have to be grown each year from seed and I usually grow woad and weld every year. If I’m lucky, I don’t have to sow seeds and can rely on self-seeded plants springing up all over the garden, ready to be transplanted to the dye garden. This year, however, I’ve looked in vain for weld seedlings, so I shall have to sow some weld seeds. As far as woad is concerned, I have plenty of seedlings coming up but I shall also sow some seed, as my friend & fellow dyer, Chris Dobson, has kindly given me some seeds from her woad plants, which seemed so much more vigorous than mine last year. So this week I shall start sowing some seeds. I may also sow some seeds for flowers, such as calendula, which I love and from which I regularly make calendula ointment to treat cuts and rashes, and zinnias, which come in such lovely colours. And I think it will also be time to start off my tomatoes although I don’t usually sow the beans and courgettes until mid-April. This an overwintered woad plant from last year which will produce a flowering stalk and provide seed for next spring. 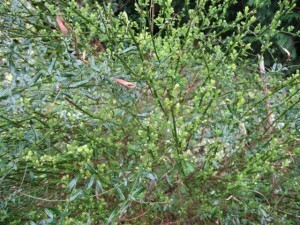 This is a perennial dyer’s broom bush, with a few seed pods to be seen and this year’s new growth starting to develop. 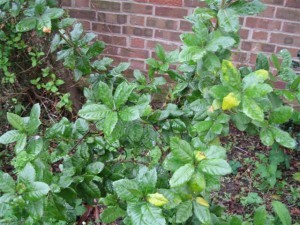 Used fresh, the prunings give lovely bright greeny yellows. This is my small evergreen oak tree. I’m not sure exactly which species of Quercus it is but it may be Quercus ilex, the Holm Oak . Last week a friend invited us to a preview of the items she has collected in her garage for a sale next month. She is planning to move house soon, so she has been clearing her house and attic of all the things she has decided she can live without in her next home. As she has been a museum curator and the wife of an antique dealer in past lives, the items for sale make a very interesting collection, especially for those of us who are addicted to weird and wonderful – and sometimes useless – artefacts from the past. So the question is: Do we have room for a full-length sabre in its sheath or two replica Cromwellian helmets or a 12-foot long wooden paddle for putting loaves of bread into and taking them out of the baker’s oven? Well, perhaps not, but I may just find a home for a wooden hat block in the shape of an old-fashioned bonnet and I do have room for a large old iron cooking pot on legs, which has a layer of rusty iron pieces in the bottom. And my husband will certainly find space on his bookshelves for two volumes of British history, especially as the date inside them is 1794, making them very old books indeed. 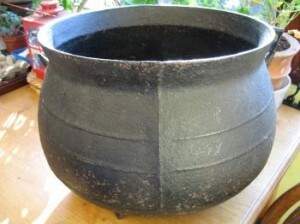 So what possible use will I have for this large iron cooking pot? Well, first of all I shall remove all the rusty bits of iron from the bottom and put them in a large container and fill it up with a mixture of 2 parts water to 1 part clear vinegar. This will then be allowed to stand for a few weeks and then become my next supply of iron water. 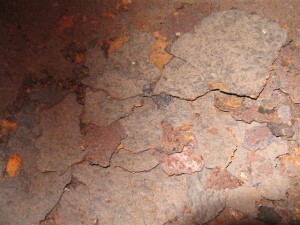 This image shows the pieces of rusty iron ready to be made into iron water. As for the pot itself, I shall first check that it’s waterproof. If it is, when the weather is warmer it will be the basis for some outdoor dyeing experiments to see the effects of dyeing in an iron pot, using unmordanted wool. And if it’s not waterproof? Well, that will be a shame but I’m sure the pot will look quite impressive with some plants growing out of it. 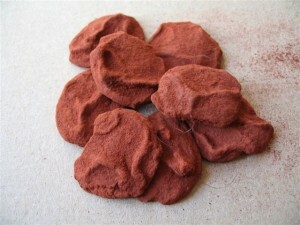 These are some discs of pressed camwood ready for crumbling up and soaking. I started by putting a layer of shavings (or crumbled camwood discs) about 2 inches deep in the bottom of a glass jar & then I covered them with methylated spirits. I did this with each of the dyes I wanted to test. 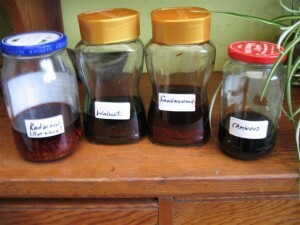 I then put the lids tightly on the jars and left the shavings to steep for several weeks until the liquid became strongly coloured. Incidentally, although meths is purple in colour, this purple doesn’t seem to affect the final dye colour. In addition to the dyes I tested, I also steeped shavings of birch in the same way but, as the liquid showed little evidence of colour change, there seemed no point in continuing with them any further. The liquid is then strained off into a dyepot, together with more water as necessary, and the fibres are added. Do not throw away the meths-soaked wood shavings as they need to be disposed of with care. Return them to their jars in the meantime. Details for disposing of the woodshavings and the used dyebaths are given below. I followed Sandra’s instructions but, as I have an electric heater, I heated the dyebath gently & then allowed the fibres to steep to absorb the colour. 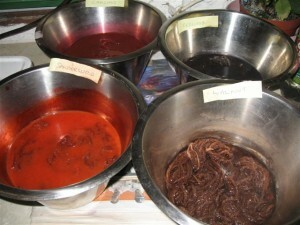 Below are the samples soaking in the dye solutions. I was delighted with the results of the dyebaths made from camwood and sanderswood, as these produced really vivid reds not obtainable from the usual simmering method of colour extraction. However, the results from the other two dyebaths were less spectacular. The colours from the walnut shavings were even paler than those I achieved from similar walnut shavings using the usual method of colour extraction. The redwood which, according to the woodturner who supplied it, came from Sequoia sp., gave a rich red colour when soaked in meths but the dyebath produced greenish shades identical to those obtained from the redwood shavings using the usual dyeing method. This image shows on the left from top to bottom: Sanderswood + no modifier, acid modifier, alkaline modifier and iron modifier; and Walnut + no modifer, acid, alkali, iron; on the right from top to bottom: Redwood (Sequoia sp.) + no mod, acid, alkali, iron and Camwood + no mod, acid, alkali, iron. It is interesting that, with this method of colour extraction, the modifiers seem to make less difference in shade than I would have expected. Although this method of colour extraction using alcohol/methylated spirits can produce really strong, bright colours with some wood shavings, there are several disadvantages to this method of dyeing. Firstly, the smell of the dyebath is very unpleasant if one uses methylated spirits, although the fumes do disappear after a while. Secondly, I found the methylated spirits left the wool fibres feeling a little harsh to the touch. Disposal of the used dyebaths may also present problems, as I would not recommend that they be poured down the drain. I poured mine on the gravel at the edge of my driveway, close to a brick wall. Disposal of the meths-soaked wood shavings might have been difficult, but my husband readily took them, still carefully stored in their glass containers, to use to start his garden fires. Otherwise, I would probably have dug a deep hole in the ground and burned them, then covered the ash with soil. Nevertheless, I was glad I did these experiments as they really illustrated very clearly the colour potential of the “insoluble redwoods” when used with the alcohol extraction method. 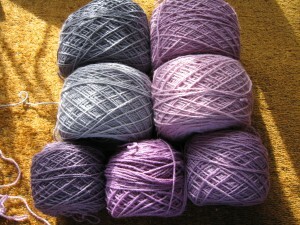 For the first time, I was able to see some of the colours that were so popular with dyers in the past. So my thanks to Sandra Rude for suggesting these experiments to me. I think next time I will see if I can buy a bottle of cheap vodka to use instead of the meths, as I should imagine that might smell less unpleasant. 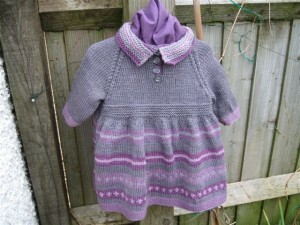 At last I have finished knitting the dress for my 9-month-old granddaughter, Milly. It’s now in the post and I hope it will fit her and that she will enjoy wearing it. More importantly, I hope that my daughter will approve of it, as I doubt whether Milly really has much fashion sense yet. In fact, I think she’s happiest when wearing as little as possible! As I prefer to devise my own knitting patterns, I designed the pattern for the dress myself. The buttoned opening is at the front and I hope my daughter will be able to put the dress on Milly easily and without too much resistance. I usually write the pattern instructions down as I proceed, making adjustments as I knit, and then when the garment is finished I type up the instructions for future reference. I really enjoy working out my own designs and watching them develop, even if I sometimes have failures and have to unravel whatever I’m making and start again. My next task will be to knit a jacket to match the dress. Recently I was asked some rather probing questions about the various names given to alum and the other chemicals used for mordanting. So since then I’ve been working on supplying some answers but, as my understanding of chemistry is limited to what I need to know as far as dyeing is concerned, I realise how many gaps there are in my knowledge. However, I hope the following information may be helpful. For a detailed explanation of the history of alum production I’d recommend Dominique Cardon’s book “Natural Dyes”, published by Archetype Publications. This is a huge, scholarly work and, although it is costly to buy, it is well worth the expense if you are looking for an all-encompassing reference book. Alum is not poisonous but it should be handled with care and not ingested. The 4 types of alum used by dyers are: aluminium sulphate, potassium aluminium sulphate (or potash alum), ammonium aluminium sulphate (or ammonium alum). – (Note: sometimes these last two are written with the word “aluminium” first) – and aluminium acetate. As far as I understand it, the different names refer to the different methods used in the processing of alum to refine it. In the early days of production, refining was necessary to make sure the alum was free from iron contamination and this was mainly done using either potassium or ammonia (or stale urine which contains ammonia). Pure aluminium sulphate (without the potassium or ammonia) contains the highest proportion of aluminium of the 3 sulphates, but by only a small margin, and is a later 19th century development, resulting from improved methods for removing the iron from alum shales. All the three aluminium sulphates mentioned above can be used for mordanting, although ammonium alum is less commonly used as a mordant. Aluminium acetate is used to mordant vegetable fibres and silk only. The alum available in the past in chemists’ shops in the UK tended mainly to be ammonium alum, used, I think, for pickling and for applying to the skin in poultices. The aluminium content of ammonium alum is slightly lower than that of the other two aluminium sulphates, but not sufficiently lower to make a significant difference. The other alum sulphates may occasionally have been available in chemists’ shops but alum in any form is rarely available over the counter in chemists or pharmacies in the UK now. It may sometimes be possible to buy aluminium sulphate in garden stores as a soil treatment and as long as it doesn’t have any iron contamination (usually in the form of specks of brown in it) it is fine to use as a mordant. The difference between aluminium sulphate and aluminium acetate is that the former is processed using sulphuric acid and the latter using acetic acid. Alum acetate is usually used for mordanting vegetable fibres and silk only, not animal fibres such as wool, mohair etc. I think the alum sulphate most suppliers sell for mordanting is probably potash alum, although it is often simply described as alum. In the 1990s, when I had my mail-order business selling dyes and mordants etc, I supplied aluminium sulphate (iron free), and not potash alum. The reason for this is simple – when I took over the business, the previous owner recommended that I should continue to supply granular aluminium sulphate (iron free), purchased from the wholesalers in 50kg sacks, as this is what she had supplied. So this is what I did. Since then, I have always used aluminium sulphate myself, so when I mention alum sulphate in my writings that’s what I mean, not potash alum. But it really doesn’t matter which of the three forms of alum sulphate a dyer uses. However, it does matter that dyers understand the difference between alum sulphate & alum acetate & what each is used for. Cream of tartar: the cream of tartar used together with alum in some mordanting recipes is potassium bitartrate (or potassium hydrogen tartrate). It was originally made from the salt deposits that formed on wine casks & could be either white or red, depending on the type of wine for which the cask was used. The culinary cream of tartar sold in supermarkets may sometimes be sodium pyrophosphate, which is slightly less effective than potassium bitartrate but still fine to use. Some dyers mordant wool and other animal fibres using alum without cream of tartar, although in some sources an alum + cream of tartar mordant is recommended as preferable to get good strong colours from cochineal & other insect dyes. I have found that mordanting animal fibres using 10% alum sulphate, without cream of tartar, gives me good results with all dyes, including cochineal, but the mineral content of my local water may also play a part in this. Washing soda (or soda crystals) is sodium carbonate. Soda ash is also sodium carbonate but with the water content largely removed. However, as washing soda can be bought in supermarkets and hardware stores, it may be easier to obtain than soda ash and is equally effective. In all the recipes in my books I use washing soda/soda crystals rather than soda ash. Iron is harmful if ingested and should be handled with care. It is usually supplied in the form of ferrous sulphate (or iron sulphate), which is a green powder. (Incidentally, when it gets damp it turns brownish but this doesn’t seem to make any difference to its viability). It may also be called copperas or green vitriol. Iron sulphate is also sometimes available in garden stores as a treatment for plants showing iron deficiency and it is sometimes cheaper to buy it this way, if you can find it. Home-made iron water (called iron liquor in the USA) is technically probably ferrous acetate, because it’s made using acetic acid, but I avoid the chemical term, as I’m not sure how accurate it is when used to describe a home-made product. Home-made iron water can be used instead of ferrous sulphate as a mordant or colour modifier and some writers suggest that iron water may be less corrosive on fibres than ferrous sulphate solutions. Copper is toxic and should be handled with care and not ingested. It is usually supplied as copper sulphate, a blue powder, and is also known sometimes as blue vitriol or blue copperas. Home-made copper water (copper liquor) is technically probably copper acetate (see comments on iron acetate above) & is occasionally called verdigris. Verdigris is the green deposit that sometimes forms on copper piping etc and I think this is what is dissolved into the solution when making copper water. 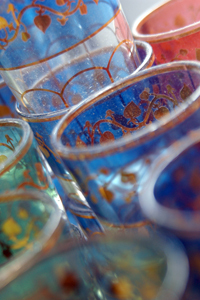 Copper water can be used instead of copper sulphate as a mordant or colour modifier. Before disposing of any liquids containing chemical residues, make sure they are well diluted with water. Iron and alum are the most common elements in the earth’s core and disposing of mordant or dye bath remains containing these chemicals should not present any problems, especially as they are used in very small quantities and most of the chemical content should have been absorbed by the fibres anyway. I usually pour solutions containing small residues of iron and alum around acid-loving plants, such as broad-leaved evergreens or blueberries. Otherwise remains may be poured down the drain or disposed of on the ground in an isolated spot, away from children, pets and septic tanks. Copper is toxic so should be handled with particular care but it should be safe to pour residues containing copper on the ground in an isolated spot as described above. Some dyers prefer to avoid using copper because of its toxicity and it is certainly possible to achieve excellent results and a wide colour range without the use of copper. I do not use chrome or tin as they are toxic, difficult to handle safely and disposal of chrome and tin residues may present problems. For more information, Helen Melvin (Fiery Felts) has written at length about mordants and alum on her blog. 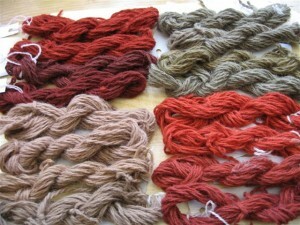 (www.growingcolour.blogspot.com) However, wherever one goes for information, one tends to find different mordanting & dyeing recipes, as dyeing can be a highly personal craft. So in the end the choices are individual ones. My aim is to make good, reliable results as simple to achieve as possible – probably because I’m an impatient person & I don’t see the sense in making things so complicated that one is deterred from even making a start. But that doesn’t mean that my methods are better than anyone else’s, so try out different recipes and select the ones that suit you best and give results that you like. This photo was uploaded by Colin from WaltonCreative as I am having problems uploading images and he was testing the site for me. Colin designed my blog for me and is also the designer of “Wild Colour”. He is always ready to help when I have problems and usually manages to solve them, so I hope he’ll be able to do so this time – and without too many scathing remarks about my lack of computing skills! I thought I’d leave this image here for a while, as an inspiration to me to try and emulate Colin’s talents as a photographer. The way the light falls through the colours on the glasses looks really lovely. We have one grandchild, Milly, aged nearly 9 months, and I am privileged in that I am allowed to knit for her. Many of my friends have been told that their grandchildren do not require handknitted garments, so I consider myself fortunate that my daughter regularly asks me to knit something for Milly. This time the request was for a dress and the desired colour scheme is grey and purply pinks. I am so glad that today’s babies wear such a variety of colours and not just the pale blues, pinks and lemons so common in the past. 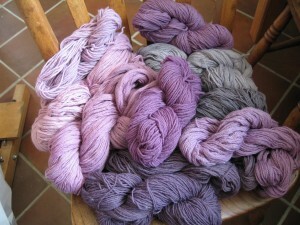 This shows all the dyed skeins – rather too jumbled up for identification. This shows, on the left, alum-mordanted skeins dyed with Cochineal, and on the right, the alum-mordanted skeins dyed with Logwood Grey. The results of the exhausts + Logwood are at the bottom on each side. 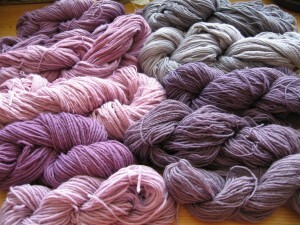 This shows some of the skeins wound into balls. Now I just have to knit the dress!